Very often people will email me and ask, what restaurants should I go to when I visit Napa Valley. I always say, with so many options, that is almost impossible to answer. In response to that question, here are my top ten entrées, as diverse as is Napa Valley cuisine. Solbar, located at the Solage Resort is my favorite place for outdoor dining. The expansive patio has plenty of shade trees, a modern water feature and lots of comfortable seating. The lunch menu is broken down into healthy, lighter dishes on one side and hearty cuisine on the other. 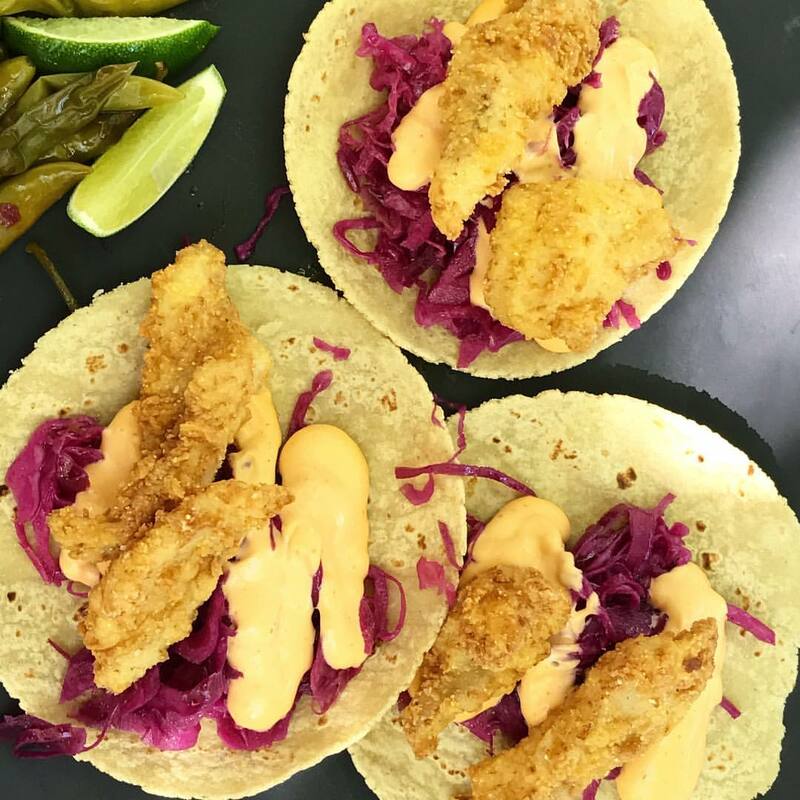 The Crispy Petrale Sole Tacos for $22 is one dish on the hearty side of the menu, served for lunch only. It’s big enough for an entrée or to share with friends. I love the presentation of this dish as well as the color and flavors of the sweet and sour cabbage. With a golden crispy coating on the sole, it’s topped with spicy aioli and cilantro. I usually indulge myself with a glass of the 2016 Rosé of Grenache-Carignan-Mourvèdre-Cinsault from Lorenza, California, a refreshing wine that pairs nicely with the heartiness and heat. It is a great dish to enjoy overlooking the resort pool on a beautiful summer day. There is nothing more decadent than Handmade Gnocchi with Peas, Pancetta, and Parmesan in a Tomato Creme Sauce. It’s the kind of dish that takes a week to burn off at the gym, so this is my go-to dish when I throw caution to the wind. It is one of many kinds of pasta on the menu at St. Helena Bistro, offered for $18. St. Helena Bistro is a casual sidewalk café located on Main Street among a string of other outdoor eateries. It focuses on Northern Italian dishes as well as American inspired cuisine. There are a variety of appetizers and salads, as well as a Lamb Burger, Penne Italian Sausage, Fish & Chips and Eggplant Parmesan, to name a few. 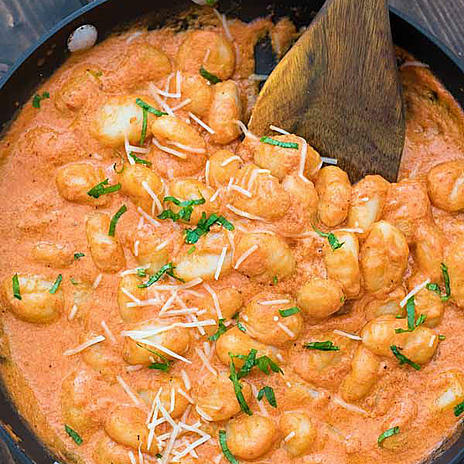 But hands down, when I head over to the quaint café, the rich gnocchi calls for me every time and pairs nicely with a vibrant white wine high in acidity. Locals always joke about herds of tourists forming huge lines at Gott’s Roadside, often well over a hundred people. Of course, the locals know ways around this dilemma when needing a burger fix on a Saturday afternoon. 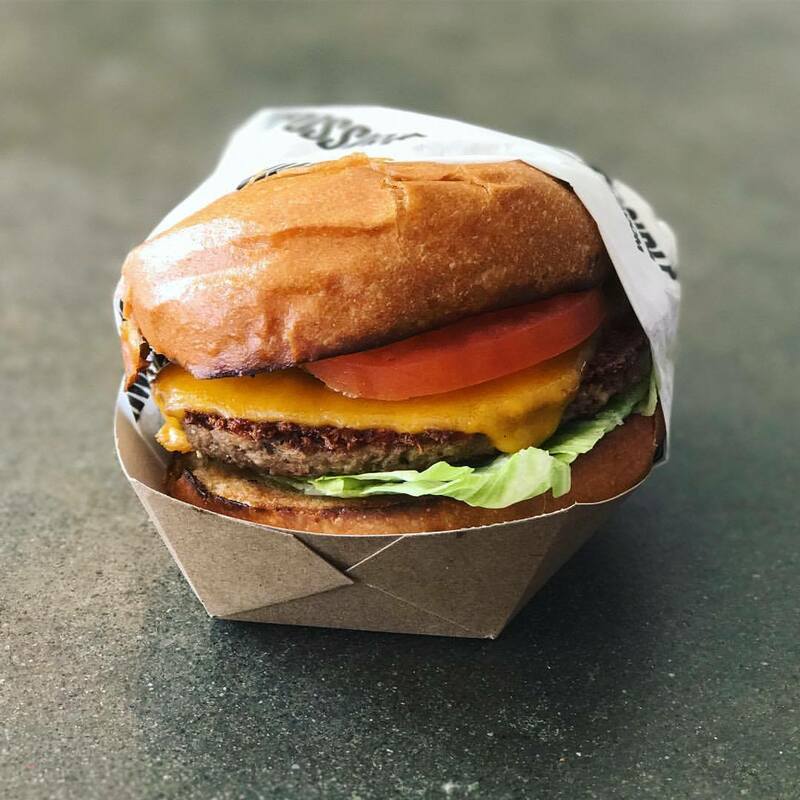 Gott’s serves a variety of different burgers from the California Burger with a fried egg, to the Kimchi Burger to the Impossible Burger. All burgers are 1⁄3 pound Niman Ranch beef patties except for the Impossible Burger, which is one of the best vegan burgers around in my opinion. You can customize your burger the way you like with various toppings and sauces. You can also swap out any patty for a Diestel Ranch turkey patty. I like to accompany my burger with my favorite side, garlic fries and maybe one of Gott’s signature, house-made shakes. Burgers range anywhere from $7.99 for a plain Hamburger to $12.99 for a California Burger. 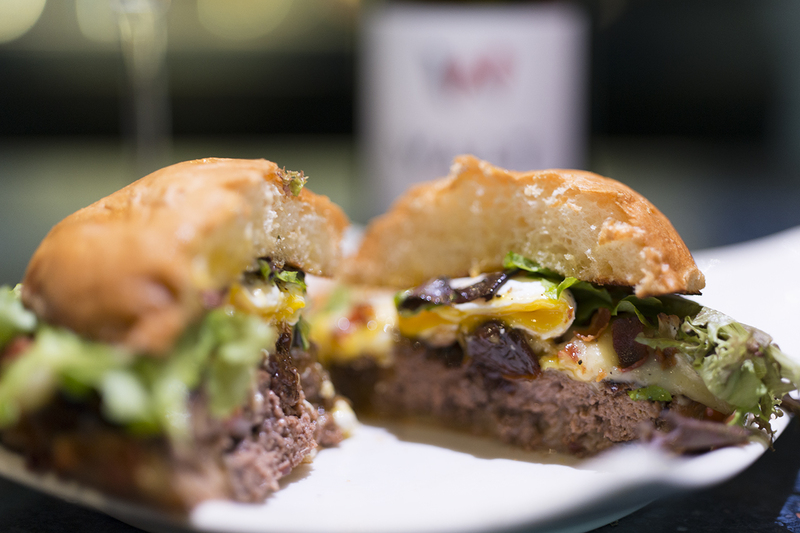 A juicy Gott’s burger would go great with a Lagunitas IPA or a glass of the Buehler Vineyards Cabernet Sauvignon. If you are a ribs fan, Market St. Helena offers some incredible ribs, literally falling off the bone when you eat them. The sweet and smoky barbecue sauce has just a hint of zing, making a luscious and balanced flavor. This hearty portion is served with creamy mashed potatoes and some of the best onion rings in the Napa Valley. If you have a healthy appetite, this entree is available for dinner at $28. I like to pair this sumptuous meal with a Zinfandel, which changes ever so often. If you want to try a smaller portion of ribs ala carte, visit Market for Wine, Bubbles and Bites starting at 3 pm. 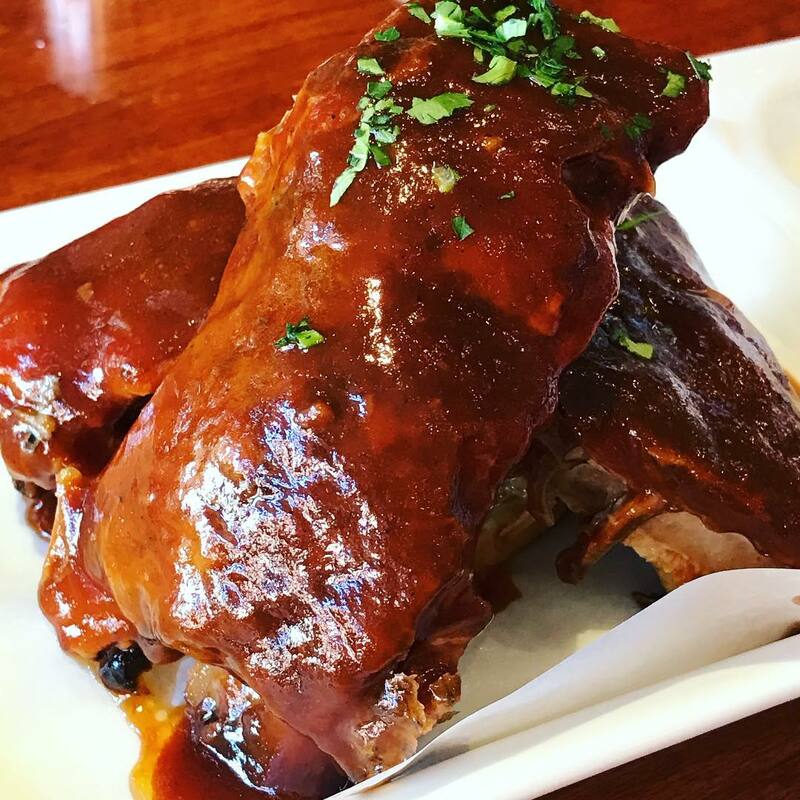 You can enjoy these delicious ribs for along with oysters on the half shell, wings, and crispy calamari, as well as wines by the glass, all for $7 each. Boonfly Cafe is a quaint eatery located at the side entrance of the Carneros Inn. Boonfly serves breakfast, lunch, and dinner and is busy especially during peak hours. Often there is a waiting list, so I usually try to sneak my way in mid-afternoon to ensure I get a seat at this favorite cafe, chilling at the bar and enjoying the BLT. I am very picky about my BLT’s and I was hard-pressed to find one exactly the way I liked. Boonfly’s BLT hit the mark in every way with its Applewood Smoked Candied Bacon, Lettuce, Tomato, and Mayo on Model Bakery Sourdough Bread, served with fries or salad. This lunch entree is sure to impress even the most discernible BLT fans at $14. Of course, no BLT is complete without a perfectly cooked egg on top for $2.5. This plate pairs nicely with the 2016 Saintsbury Rosé also from Carneros. Pop into the Boonfly Cafe when you are between tastings in the Carneros area and enjoy this cozy café with great food. I love to go to Bistro Jeanty for lunch on the weekends. Located in the heart of Yountville, it feels like your dining in Paris at a street side café. 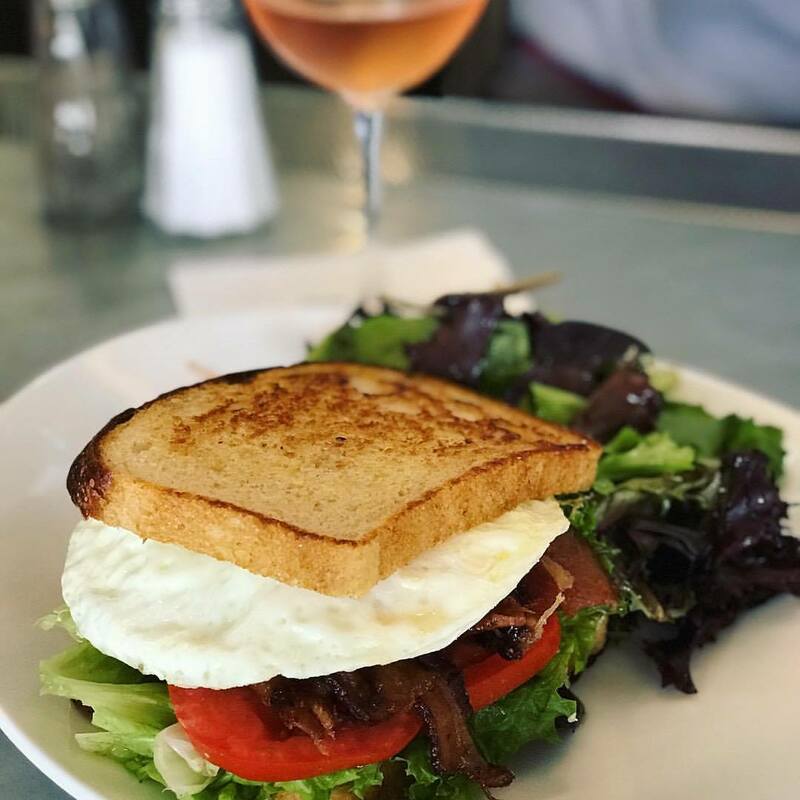 With both indoor, intimate seating and pet-friendly outdoor seating, Bistro Jeanty has many options for visitors and locals alike. 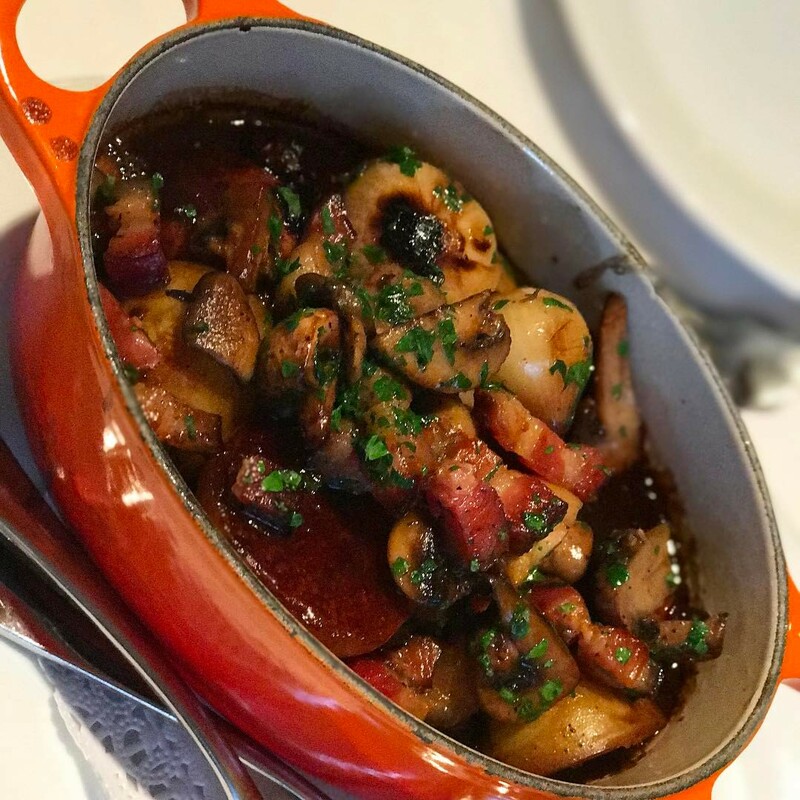 The menu has many authentic French dishes, including, Escargots, Soupe a l’Oignon (French Onion Soup), and Cassoulet, but my favorite is the timeless Coq Au Vin. Although not documented until the 20th century, Coq Au Vin has believed to have been around for centuries. It’s comprised of chicken, mushrooms, onion, and lardons in a red wine stew. There are many versions of Coq Au Vin which literally means “rooster with wine,” Bistro Jeanty’s recipe is délileux. Bistro Jeanty uses apple smoked thick pieces of bacon, pearl onions, and fresh mushrooms. The stew is plentiful, served in a Le Creuset for $22. I recommend ordering a side of Butter Egg Noodles, to accompany the Coq Au Vin. A glass of Burgundy would make this meal even better. Brasswood Estate is a collection of food, winemaking, and wine tasting as well as event space. Located inside the estate is Brasswood Bar + Kitchen, catering to visitors and locals with specialty cocktails and farm-to-table dishes such as salads, seafood, and pasta. One pasta on the menu, Duck Bolognese, comes in at number four on my list. This unique pasta combines Sonoma duck with red wine and mirepoix (slow cooked diced vegetables in a browned tomato sauce) over thin handmade fettuccine. The duck creates a rich bolognese with hearty flavors that differs from beef bolognese. 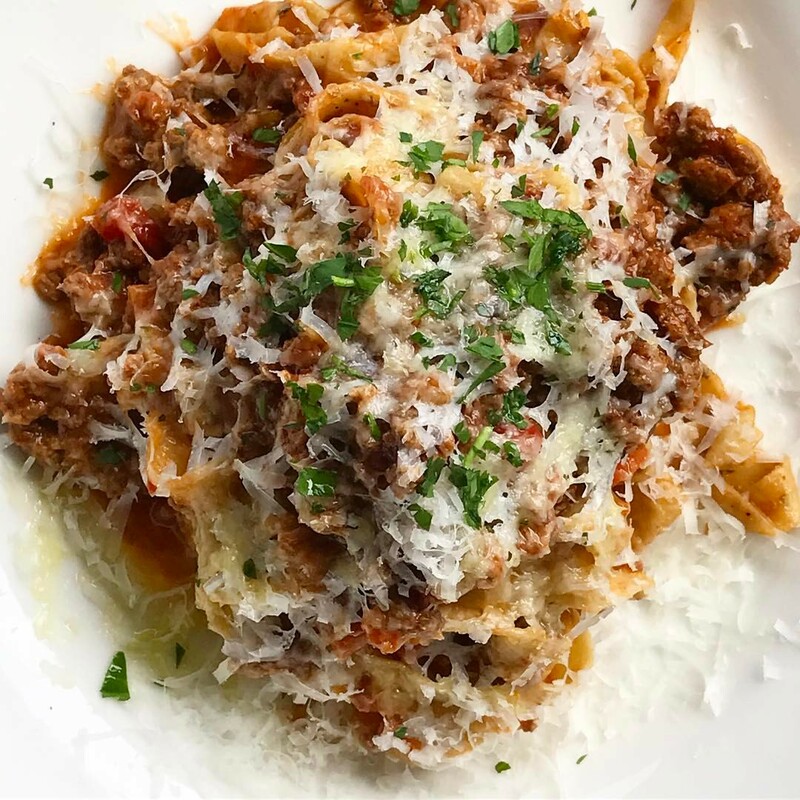 The pasta is fresh, cooked perfectly and the dish is topped with parmesan cheese by request for $24. Brasswood also offers half orders of the pasta and is still a decent portion. I suggest pairing a Pinot Noir with this particular pasta. When you think of Napa Valley, you think of fancy steakhouses, Michelin Star chefs, and art on a plate, but sometimes the best cuisine around is not your publicized, mainstream place but a hidden gem. Himalayan Sherpa Kitchen is one of those places that serves authentic, traditional Himalayan/Nepalese dishes, one of these being Tikka Masala. 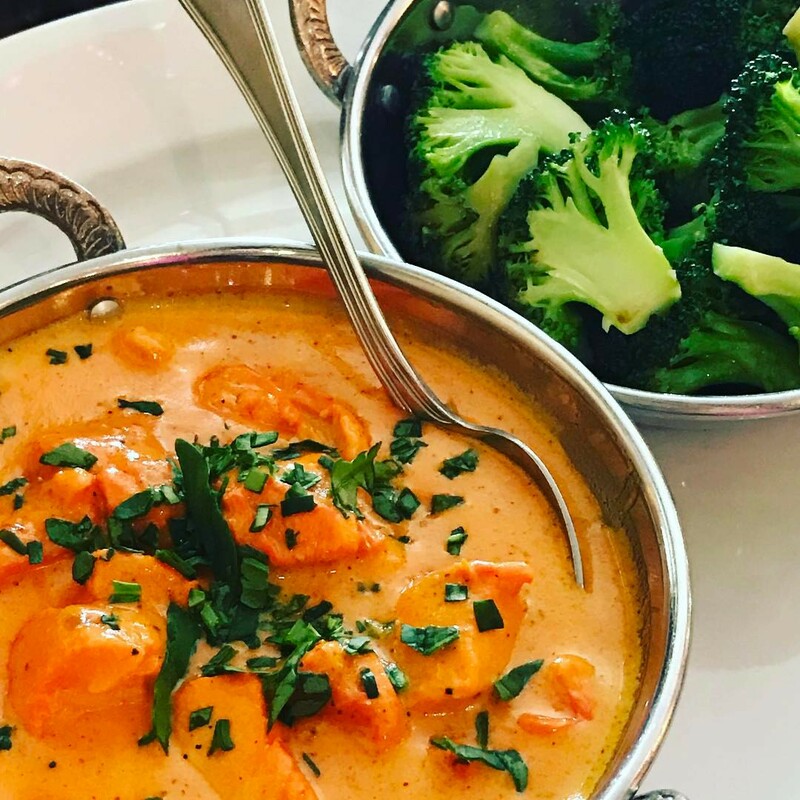 I don’t know what it is about this entrée, but when I get a craving for it, there is no stopping me from walking down the block into town and ordering up Chicken Tikka Masala, brown rice, seasoned broccoli and garlic-basil naan. Sherpa Kitchen uses fresh ingredients, and there are many variations of Tikka to chose from; veggie, organic tofu, lamb, salmon and my favorite, free-range chicken. They range in price from $13.95 to $16.95. Customize your level of spiciness, as I prefer mild plus Tikka paired with a glass of chilled Blackbird Vineyards Rosé. If you are in Napa Valley looking for something ethnic and tasty, especially on a cold day, seek out Himalayan Sherpa Kitchen right on Main Street in downtown Saint Helena. 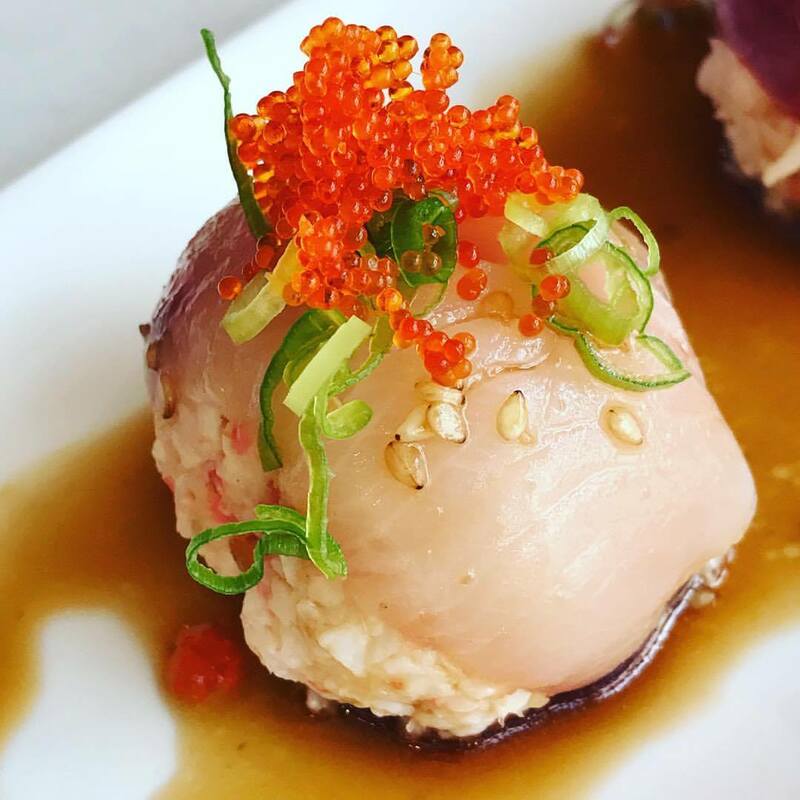 You are probably asking, what is a Hamachi Bon Bon? I like to call it my “sinful sushi” dish, so delicious; you can’t just have one order. In fact, I think I may hold the record for most bon-bons in one sitting, twelve. The great thing about sushi is that you can eat a lot if you stay away from the rice. A Hamachi Bon-Bon consists of wrapping a slice of fresh Hamachi around a ball of mixed snow crab and Japanese Mayo, topped with Scallions & Sesame Soy Tobiko. Eiko’s, with two locations in Napa, makes the best Hamachi Bon-Bon to date. Eiko’s larger restaurant is located in the revitalized downtown Napa next to the new Archer Hotel. The smaller location is inside the Oxbow Public Market. Both places serve this yummy Japanese treat. The sweetness of the crab and the salty soy tobiko, along with fresh hamachi will leave you wanting more. I always pair this with the St. Supery Sauvignon Blanc, which cuts through the richness of the Japanese Mayonnaise but elevates the seafood elements. Technically this dish is an appetizer at three bon-bons for $12. But you can add a fourth for $16 in which I would call it a decent sized meal. I had no problem selecting my number one pick for favorite entrée in Napa Valley. This dish isn’t something you see on a menu every day or even once in a while, and it may not be mainstream, but if you are willing to try it, you won’t be disappointed. This Ostrich Burger at Carpe Diem in downtown Napa is a fun take on your standard burger. It’s a healthy size patty served with Triple Cream Brie, Cherry – Cabernet Compote, Toasted Brioche Bun, and a side of Truffle Fries for $22. For $27 you can order the burger with a duck egg, called Carpe Style, which I highly recommend. Ostrich meat is surprisingly delicious and juicy as well as good for you, being one of the leanest meats out there. The flavor is rich and is served medium or slightly pink. The Brie and Cherry- Cabernet Compote creates a nice flavor triangle of sweetness, savory and, richness. The truffle fries bring a nice contrast, completing this perfect dish, a definite must-try for anyone adventurous! The Bon-Bons look and sound incredible. It’s on my list for my next visit to Napa. Thanks for sharing! Yes definitely try them! I could eat them all day! Time for you to try everything on my list!